Martell Noblige is so distinct it has created a whole new reference point in the Cognac category 'Qualite Superieur' that finds its place a step above VSOP's. Noblige's dark copper hue, pear and lemon nose and smooth, floral taste are the result of combining a greater share of eau-de-vies from the famed Borderies growing area and aging the superior blend in new "noble" fine-grained oak barrels. The sleek, sensuous bottle and label offer the first hint of the exquisite product inside. Noblige's contemporary design combines subtle elegance with breakthrough innovation in which the crystal clear glass magnifies the Cognac's vibrant hues. Martell is the oldest of the four major Cognac Houses and is world renowned for creating the broadest range of superior Cognacs, concludes Domond. 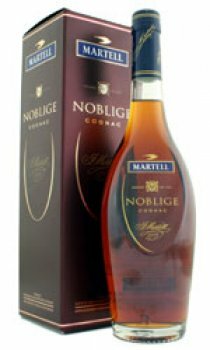 Noblige is an extraordinary Cognac and a perfect fit for the Martell family.